Well, week 1 of the Amazon adventure is in the books. And it's not exactly what we thought it would be. Don't get me wrong, we knew it would be work.....real work. We've read the blogs from other workampers enough to know it wasn't like working at a campground or our previous job in Mt Hood. But I don't think either one of us was ready for the reality. On our applications we stated that we would prefer a job walking, not standing. That's not exactly what we got. We're considered 'shooters'. Or maybe the correct spelling is 'chuters' as in we manage chutes. We are in the shipping department and work along an assembly line where customer orders containing multiple items are pooled together to be boxed. Example: a customer orders 2 tubes of toothpaste, a pack of batteries, a romance novel, ski gloves and....let's say an adult oriented personal toy (and you know what I mean). Other employees 'pick' these items one at a time from the warehouse stocks and they are loaded individually onto a conveyor. The conveyor is smart and knows to pool the individual items at a single chute. Once all items are pooled into a chute (this may take a couple of hours) the chute lights up telling 'chuters' (us) the order is ready for boxing. We scan the chute with a bar code reader and the computer tells us what items should be there and what size box is needed. We form the box from flat stock, scan and package the individual items, close, tape and bar code the box before placing it on another conveyor to be addressed and shipped. That's not the hard part. The hard part is that we basically stand for 10 hours a day doing the work....neither one of us is used to that. We're a little sore from the bending and our age is showing in how our fingers and hands feel....but we expect that to get better. What really hurts is our feet. And we're really hoping that gets better quick. Our normal schedule is Fri-Mon, 10 hours a day. We've formed a car pool with two other workampers and one of them has already been asked his preference for which day of the week he could work should mandatory overtime be required. And from what we've read this is a likelihood for all of us. Today is our day off and we're taking advantage to get off our feet! We still have a lot of chores to do.....laundry, grocery shopping, etc......but we fully intend to rest. Might even get a massage....foot massage! We'll see. OOOO Baby that sounds good. When our job at Amazon ends we've decided to drive our car home for Christmas/New Years and stay for several weeks. We should be working into the week before Christmas so we've been researching what to do with the MH while we're gone. 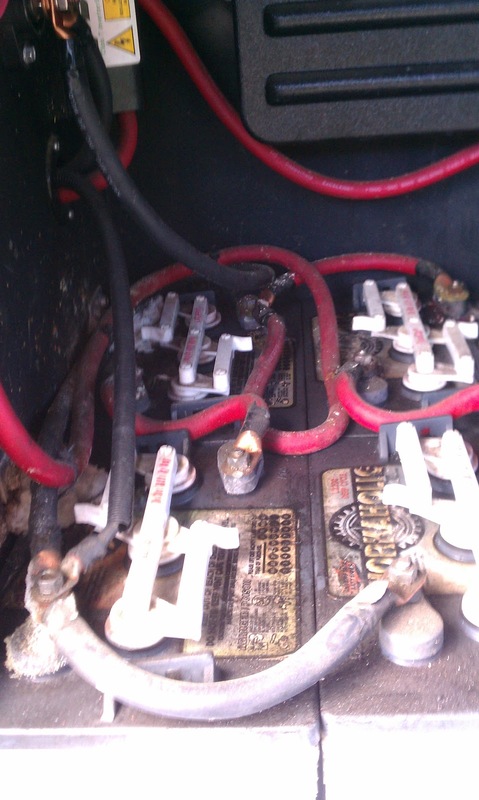 We looked at winterizing and storing; leaving the MH hooked up in a campground, etc. We think we've found a good solution; indoor climate controlled storage. We've found a place where we can store both the MH and bikes without having to winterize either; and it's indoors.... quite a bit more secure than most storage lots. And the cost is quite reasonable. That way we can relax while we're home, not worry about things freezing or being damaged while we're gone. And rather then a flight back to Nevada we can take our time returning, enjoy the drive and sight-see a little along the way. We want to stop at my son's new home in Atlanta and see Joan's brother Jimmy and his family in Alabama. And when we get to Sparks we just stock up on groceries and head out to our next location. We're researching what to do between our return to Sparks after the holidays and the start of our summer gig in Colorado. We're thinking we'll try our hand at a volunteer job (no pay, just a free site) for a month or two somewhere between here and there. Wednesday we're meeting some of our fellow 2013 Colorado workampers for lunch. Sandi and Joe are in Fernley working for Amazon as well, but with more than a thousand seasonal workers just starting we haven't met them yet. 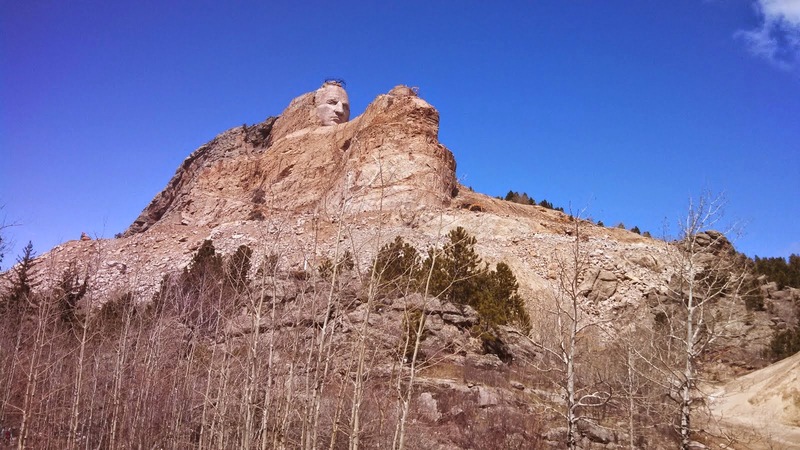 They've worked at Chalk Creek in Colorado for two years and are returning next year. Joan and I will be the rookies at Chalk Creek as the other 3 workamping couples are all returnees. That's all for now. If you are aware of a Saint for Ailing Feet (or Amazon workers) please let us know. We're going to be buying gel inserts for our shoes and I figure we'll take all the help we can get. 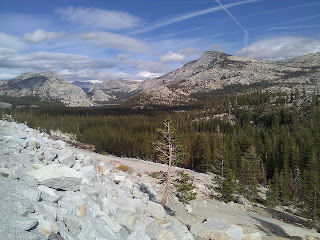 Fortunately we had filled up in Sparks so we continued on our way through Tioga Pass. Absolutely beautiful. 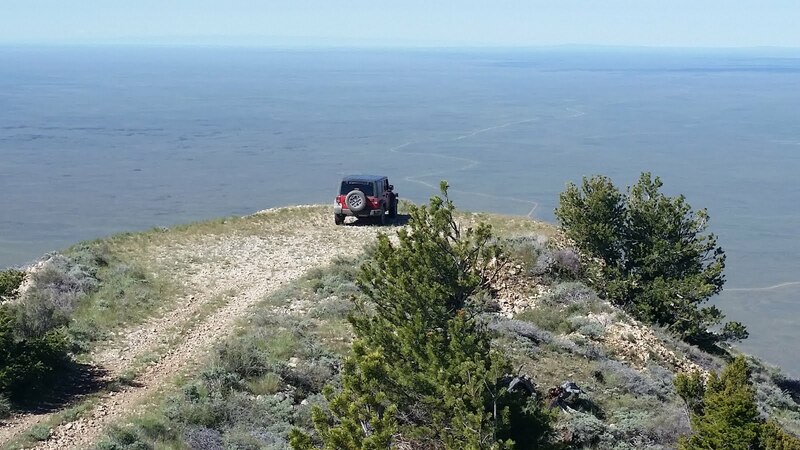 The temps dropped into the 40's as we climbed to the summit at 9943'. 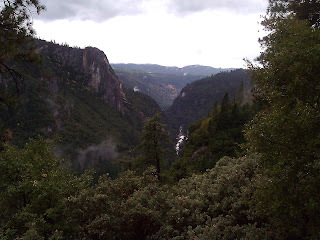 We drove along higway 120 through Yosemite and decided to get a room on the west side of the park in Mariposa, CA before we explored more of the park on Monday. When we woke up Monday it had begun to rain as a winter storm was crossing the Sierra Nevada Mountains. 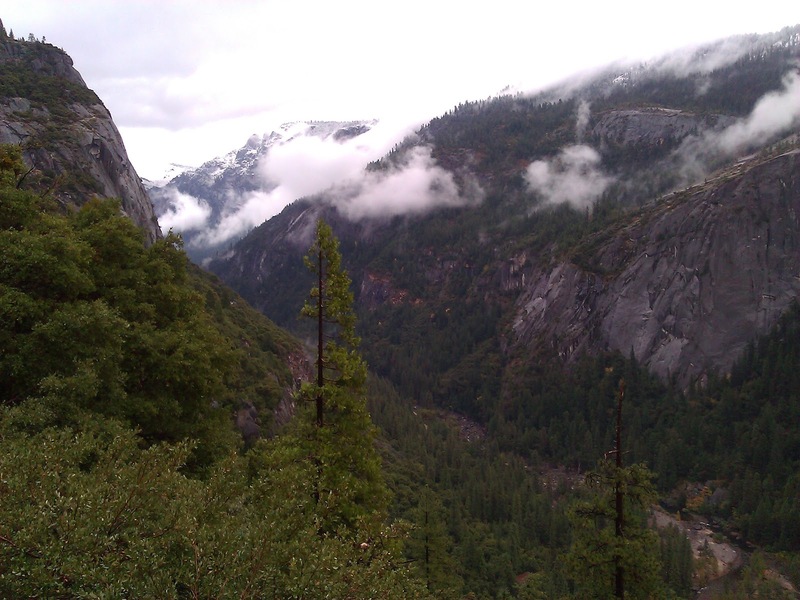 We drove into Yosemite Valley hoping to get a glimpse of Half Dome, El Capitan and the other wonderful sites. Alas it was not to be. The clouds were very low and we could only see 100' - 200' up the slopes of the surrounding mountains. 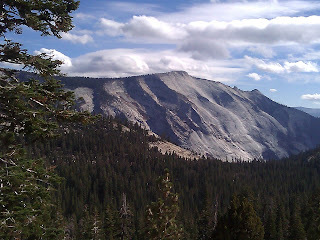 We decided to head home and headed back towards Tioga Pass. 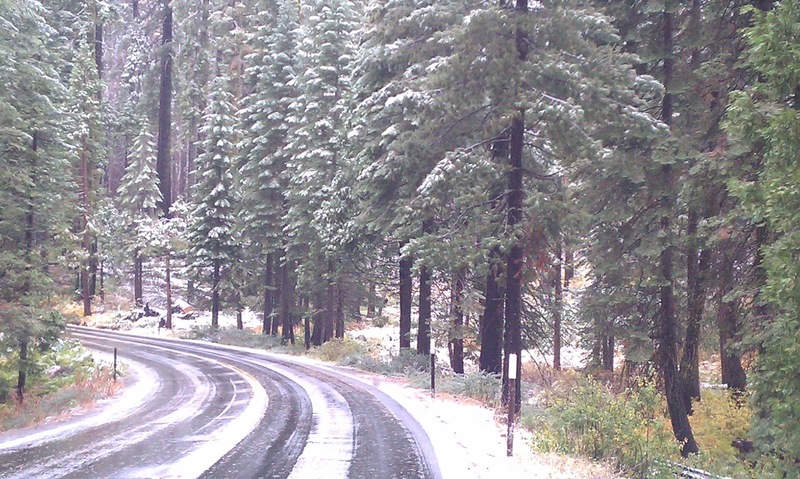 At least that was our plan until we started to see snow along the roads and in the surrounding trees. After marveling at the sights and taking lots of pics we called the Traffic Update phone line and discovered that Tioga Pass was closed due to snowfall, so we started checking the other pass's....Sonora Pass; closed unless you had snow chains or 4-wheel drive with snow tires (what are the chances a pair of newby Floridians would have snowchains?). So we checked on the next pass...Ebberts Pass; closed without 4-wheel drive or snow chains.......as was the next pass Luther Pass. What that means (to the folks back home in Florida) is that all the roads across the Sierra Nevadas to the east and our shorter route home were not an option for us. We would have to drive about 150 miles north to just east of Sacramento and pick up I-80 to return to Sparks. The traffic line stated that I-80 was open. We found a scenic road that would get us where we wanted to go and headed out. The drive was pleasant but long. Except that the temps were in the 50's I would have loved to have been on the bike. Nice curvy scenic roads through the mountains and valleys and great pavement.....this drive is going on my 'To Do' list one day in the future. We got to I-80 and turned east towards home. We were traveling along just fine climbing in elevation as we headed towards Donner Pass. Then we started to notice snow in the trees. Then snow on the ground and along the sides of the roads....and it was getting deeper as we drove further. Apparently it had snowed quite a bit overnight. Traffic was getting slower and slower. The temps continued to drop into the 20's as we climbed. 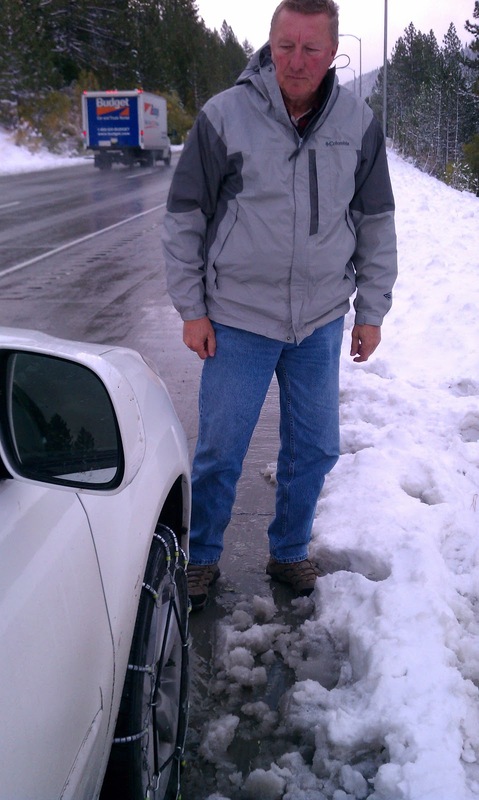 We started to notice the truck drivers and local entrepreneurs stopped along the interstate installing snow chains. The roadway was wet but there were still lots of cars continuing without chains so we followed along. I knew I would need to stop for gas before we got home so we started looking for a place to pull off. The snow was over a foot deep along the exits and I didn't want to pull off only to get stuck. Then just before the pass (did I say Donner Pass?) traffic was being stopped and checked. 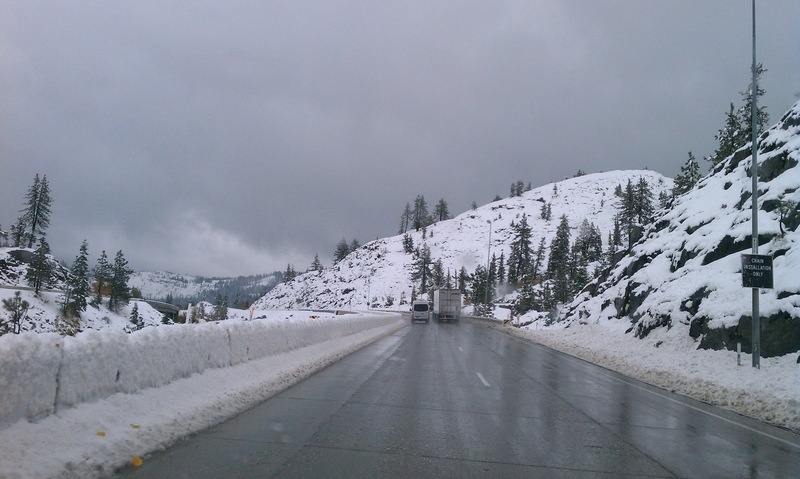 Only vehicles with 4-wheel drive or snow chains were being allowed to continue. I guess things had gotten a little worse since we had called the traffic information line. We pulled off and into a Shell station. 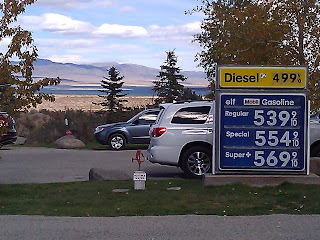 We filled up with gas and noticed all the people stopped and either installing or buying snow chains. It was a madhouse. Joan was really concerned when someone pulled up next to us and then began to slide as they tried to maneuver their car. 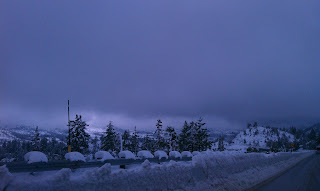 Our options were to A - turn around drive back towards Sacramento looking for a motel hoping the pass would be open Tuesday, or B - buy snow chains and attempt the pass (I did say Donner Pass didn't I?). We opted for option B. The situation being what it was, the gas station was the only place to get chains...so their prices weren't what we would hope to find at Walmart or NAPA. The chains went on and we headed out at 35 mph. We climbed our way through the pass and a few miles down the road we removed the chains before continuing our way home. On Wednesday we reported to Amazon at 6:45am (yes I said AM) for orientation. We took a tour of the facility; attended presentations and watched short films to ensure we understood what Amazon was all about. We signed our employment contracts and got our job assignments. Joan and I will be working Shift 7 (Fri - Mon) 7am-5:30pm in Shipping. We met two other workampers who are staying in our RV park and work the same shift. We're going to be carpooling as the drive is 30 miles one way. The temps tonight are forecast to be in the 20's so it will be a cold start when we leave for work Friday morning. We're headed out to run some errands and pick up some cold weather supplies to insulate our water line. 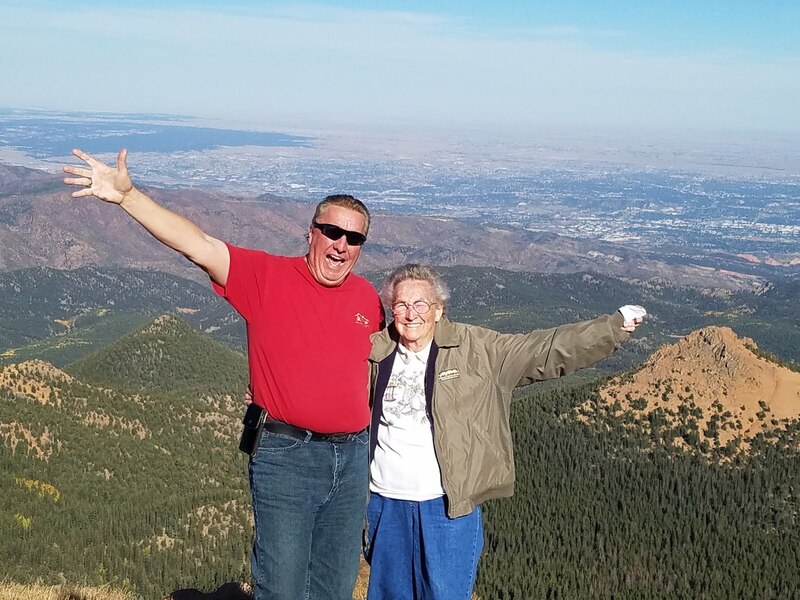 Joan and I finished our first workamping job on Monday the 8th and headed out for a few weeks of relaxation before reporting to Amazon in Fernley Nevada. We headed out east through the Columbia River Gorge stopping at Emigrant Springs State Park just east of Pendelton. This was the second Oregon State Park in which we've camped and one of several that we've driven through or visited. I've got to say that the Oregon State Parks we've seen are excellent facilities. In speaking with the camphosts we've learned the parks are funded by the Oregon Lottery. And great care is taken to ensure the parks are in great shape, both in the quality of the infrastructure and the visual aspects of the parks. I was unable to get a Dish signal through the trees so we missed Tuesday nights episode of SOA, but we did get to visit Wallowa State Park and the small community of Joseph just west of Hells Canyon. 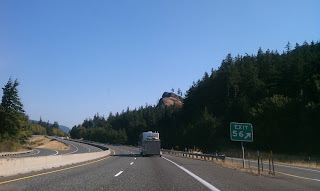 On Thursday we drove further east along I-84 before stopping near the Idaho/Oregon state line at Catfish Junction RV park. We stayed here in April on our way west. We'd hoped to take the motorcycles for a ride, but decided to take the car on a sightseeing trip Friday. And we're glad we did. We left early for a trip to Hells Canyon Dam about 90 mile north on the Snake River. We knew it might be cool, but we weren't expecting the 39 degree temps we encountered just a few minutes after we left the campground. Later in the day the temps got more comfortable, but an early morning bike ride would have been very cold. Even though the maps indicated about half the drive would be on unpaved roads, we were pleasantly surprised to have pavement the entire route. The drive was pleasant and the views were great. We stopped at one of the overviews and had lunch. Saturday we headed south into Nevada. 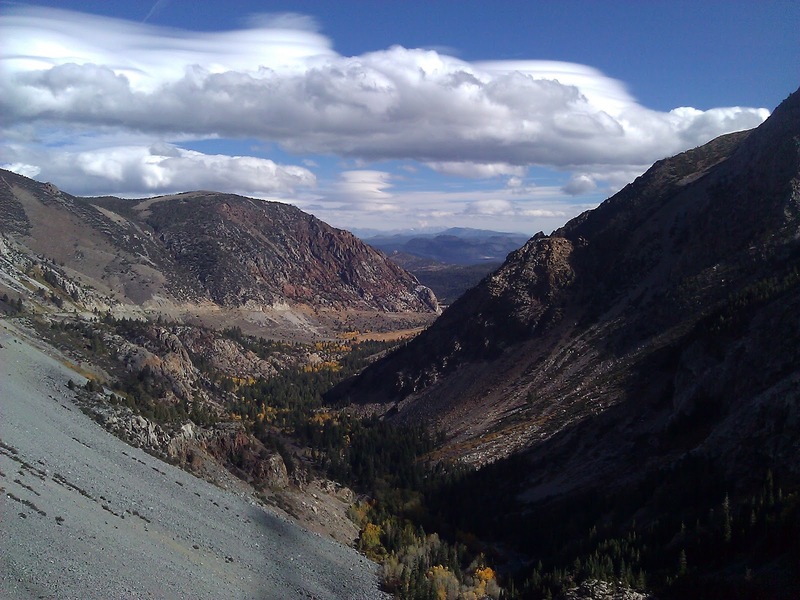 We figured we'd find numerous parks and campgrounds to stop overnight along the way, but the drive down US95 offered few options unless we were willing to take side roads (most of them unpaved) for several miles to the campsites. We stopped in Winnemucca and on Sunday spent a lazy day hanging around the RV. Monday we drove to Fernley where we will be working until Christmas. We decided to boondock at Walmart Monday night before driving into Sparks to explore the Reno/Tahoe area before we report to work. Tuesday dawned bright and early. Over the last year we've had several issues with the batteries and to the best of our knowledge they are the originals from 2005. All things considered they've paid their dues so we decided to replace them. 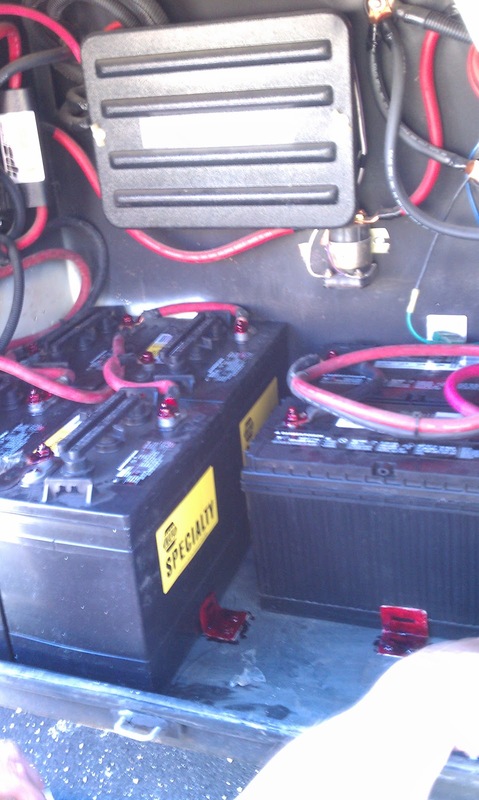 4 hours and several hundred dollars later we now have a new set of batteries (both house and chassis) and things are working great. As soon as the batteries were replaced we pulled in the slides and headed west for Sparks Nevada, where we will be parking while we work at Amazon. The park is really nice, but the WiFi is not the best we've ever had access to. We got an email from Amazon on Wednesday stating that we would be starting work on 10/24. We are supposed to show up at 6:45am for training and will be working Shift 7 Friday-Monday. Wednesday we hopped in the car and headed to Lake Tahoe. The drive was short and once we got there very scenic. The water color in the mountain lakes is spectacular. Both Crater Lake and Lake Tahoe are beautiful. Thursday we hung around the RV park fixing some odds and ends in the coach. 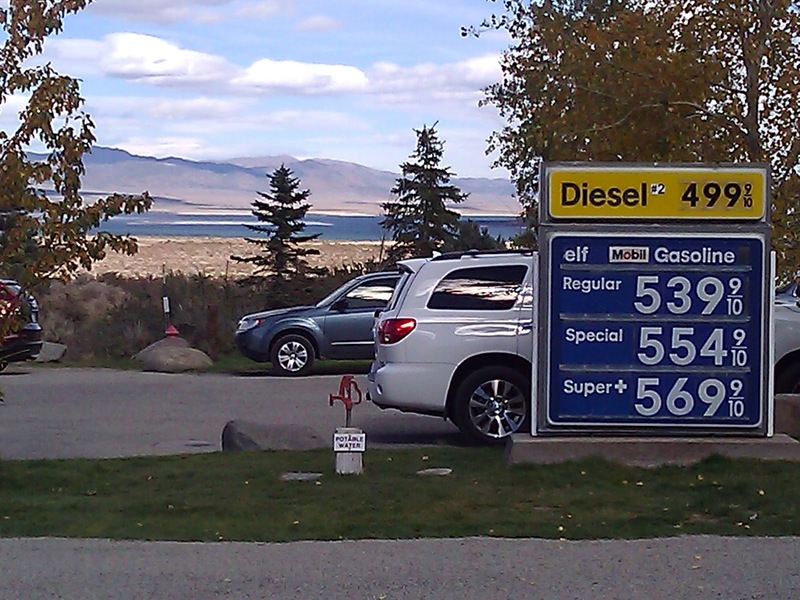 On Friday we unloaded the bikes and headed for Pyramid Lake about 35 miles north of Sparks. Not much traffic, especially on a short side trip on Eagle Canyon Rd before we got to Pyramid. Again beautiful blue water. And the Answer Is......"We're Going to Hell!" 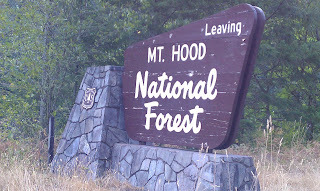 Monday will be 5 Months, 3 weeks and 4 days since we arrived in Estacada, Oregon. Even though the work has slowed down quite a bit in the last few weeks, our time here has really flown by. Of the 17 campgrounds along the Clackamas River, only 4 are still open; and 3 of those will close next weekend. On Monday I've been asked to assist the maintenance supervisor close and shutter a 2-story cabin. Monday will be our last day working in Mt Hood National Forest this season. This season we both learned a lot about workamping. After all when we started in April we didn't know anything as this was our first workamping experience. We met some wonderful co-workers and some unusual campers. We drove tractors, felled trees and herded bats and birds. We cleaned campsites and restrooms. We collected camping fees and lots of memories. And we explored, explored, explored.......As much of Oregon as we could; including a couple of short jaunts into Washington and California. We feel as though we got to see everything we intended to; even though we're sure there is a lot more stuff that we didn't know about. Maybe we'll see that stuff on our next trip through Oregon. On Tuesday Joan and I will be headed towards our next workamping experience. We are scheduled to report to work at Amazon in Fernley Nevada the week of October 28th. For the next few weeks we plan to cruise around looking for interesting places to visit between here and Amazon. 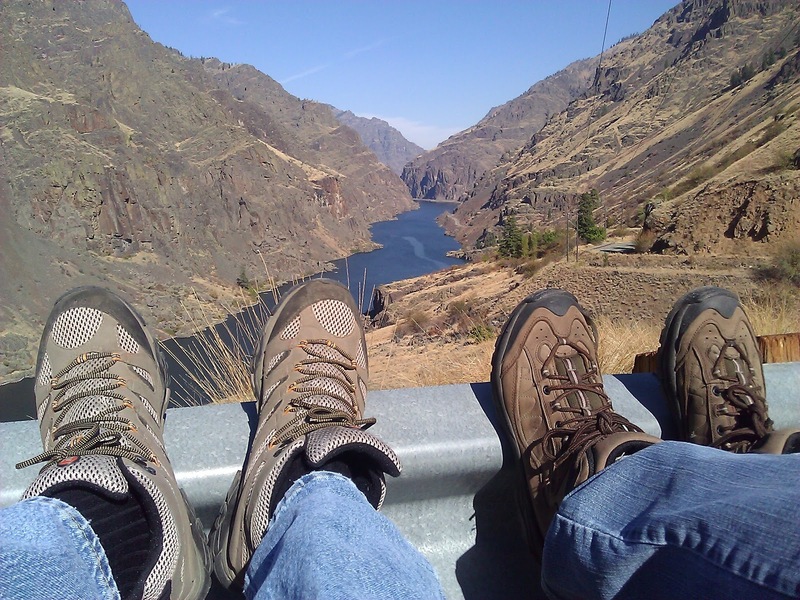 We've been asked several times if there's anywhere specific we're going and Joan keeps telling everyone "We're going to Hell"; Hell's Canyon that is.....It is the deepest canyon in the US, deeper than the Grand Canyon. It's located a little ways off I-84 in eastern Oregon/western Idaho. 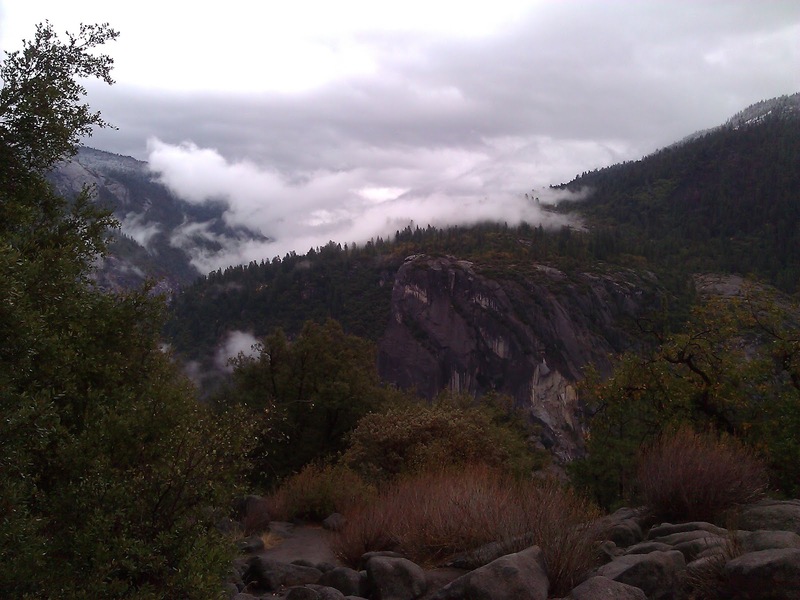 There's also the small community of Joseph found in an area called the Oregon Alps that we're hoping to explore. - That answer is obvious as we've already accepted a position in Buena Vista, Colorado for next summer. Chalk Creek Campground. Would we work in Oregon again? - Yes, but not anytime soon as there are lots of other western states that we want to explore over the next few years. And there's the trip to Alaska we'd like to make in the next 2-3 years. Would we work for CLM again? - Absolutely. We really enjoyed working for CLM and feel as though they offer workampers one of the better compensation packages. All things considered this has been a great experience for us. We're really happy we made the decision to fulltime. And we're looking forward to our next adventure.